Will Hereditary Hair Loss Affect You? Hair loss or thinning caused by genetics is referred to as androgenetic alopecia, or, more commonly, hereditary hair loss. Unfortunately, medical science has yet to discover a cure for hereditary hair loss. Thanks to advancements in science and medical research, however, we have a better understanding of how heredity affects hair thinning and hair loss and what we can do to prevent its onset. Our bodies naturally produce the hormone testosterone, which signals our bodies to produce new blood cells, helps ensure muscle and bone health and plays a role in how we respond to stress. Type II 5-alpha-reductace is an enzyme that is held in the hair follicle’s oil glands, converting testosterone into DHT. Hair follicles with sensitivity to DHT due to heredity will begin to shrink or miniaturize until eventually going away. While science has yet to fully understand the role of DHT and hair loss, we do know that when the DHT conversion process is suppressed we are able to slow hair miniaturization. If you are predisposed to hereditary hair loss, the key is to begin slowing down that process by working to prevent its full onset. The way in which the thinning occurs is different in both men and women. The pattern of hair loss for a man usually starts at the temples or crown of the head. As the hair continues to recede and thin, eventually those areas will widen to form a larger bald spot. 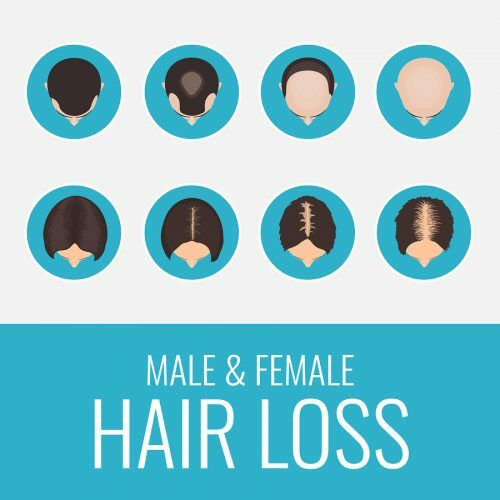 While male pattern hair loss may be more commonly recognized, and fashionably accepted, it can still be extremely stressful and seen as unwanted by those experiencing it. Women experience hereditary hair loss in a much different way. Hair thinning affecting women usually does not follow a specific pattern and does not result in baldness. Instead, diffusion occurs gradually causing hairs to thin resulting in less volume and density. Hereditary hair loss that is not treated can eventually reach a point where more scalp is visible than hair, and, in many cases, is not detected until a significant amount of hair has already been lost. Early detection of hereditary hair loss is essential to preventing against future hair thinning and more loss. Jeffrey Paul’s Hair & Scalp Specialists offers their exclusive ScalpCheck, an advanced diagnostic procedure that screens for and prevents against hereditary hair loss, as well as other hair and scalp problems. Jeffrey Paul’s team of professionals is trained in trichology, the scientific study of the hair and scalp. ScalpCheck is an in-depth analysis of your scalp and hair used to identify underlying causes of your hair and scalp condition. Certified trichologists use non-invasive, non-surgical medical appliances and four specialized camera magnifications to sense and view hydration and oil levels in the skin and hair. Once the root causes of hair loss and other scalp problems have been determined, Jeffrey Paul’s specialists tailor your scalp and hair care regimen based on your individual needs with one goal in mind: hair loss prevention. Do you have a blood relative with hair thinning or hair loss? If so, you are at a greater risk for Hereditary Hair Loss; now is the time to take the steps to prevent against its onset. Do you feel you currently have a problem with your hair or scalp that you are looking to correct? Has your hair loss reached a point where you are seeing more scalp than hair and are looking for a solution to restore lost hair? Is Shampooing Causing Hair Loss?